War Resisters' International's Council have made a statement in solidarity with the Syrian civilian population who are victims of the ongoing war. We promise to act in support of individuals and grassroots' groups who, in the midst of violence, continue to resist militarisation and war, persist in the nonviolent struggle against the dictatorship and for democracy in Syria, and show the way to peace. Hear no evil, see no evil, speak no evil: Activists in Israel dress as soldiers to take part in a protest, in solidarity with imprisoned conscientious objectors"Thanks to our links with WRI, real, tangible international solidarity has become possible. 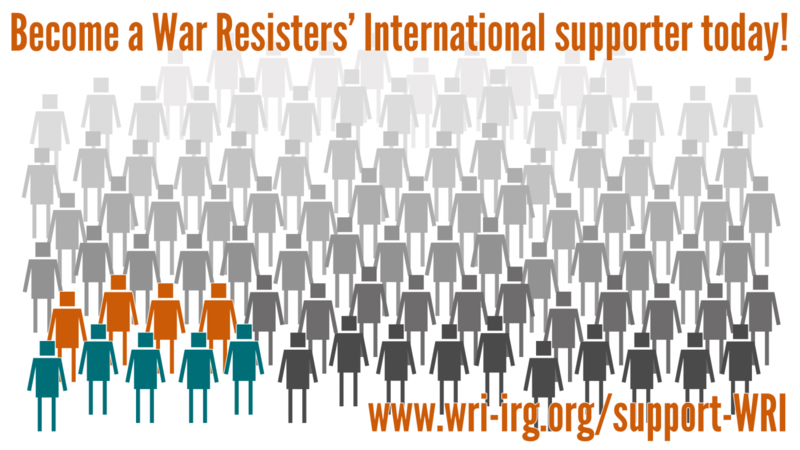 For conscientious objectors in Israel, and for the Mesarvot network who support them, this solidarity is significant; working with WRI means we are now connected with supporters all over the world. The WRI network has taken on our campaign as its own, by offering creative ideas, connections, and support, alongside a deeper understanding of what may work in each context. Connecting with WRI has helped us to link with other people and organisations who may be able to help." Read a letter from conscientious objector Taya Govreen-Segal, and help WRI to keep supporting war refusers all around the world. The trial of three human rights defenders and journalists from Turkey, who are being tried due to their participation in a freedom of expression campaign for a pro-Kurdish daily newspaper, began in Istanbul on 8 November. War Resisters’ International, together with many other national and international organisations, were ready at the courthouse to support Prof. Şebnem Korur Fincancı, the president of the Human Rights Foundation of Turkey, and the journalists Erol Önderoğlu and Ahmet Nesin.